OlyBet - Fair Play | Kampaaniad UCOP VEGAS: VÕIDA LUKSUSLIK LAS VEGASE REIS KAHELE! Oleme tagasi populaarse UCOP turniiriseeriaga, kus garanteeritud auhinnarahaks lausa €500 000! UCOP Vegas pakub turniire alates 14. kuni 28. aprillini, kus mängijad saavad võita luksusliku Las Vegase reisi kahele väärtuses €7500 ja online turniiripileteid €2500 väärtuses. Kui lõpetad meie UCOP Vegas edetabeli esikohal, viid koju €2500 väärtusega online turniiripiletite paketi, mida saad kasutada selleks, et liituda ükskõik, millise meie online turniiriga JA eksklusiivne Las Vegase reis kahele väärtusega €7500. Unikaalne Las Vegase pakett sisaldab lennupileteid, limusiinitransfeeri lennujaamast hotelli, majutust ja valikut erinevatest tegevustest, mida Las Vegases nautida. Eksklusiivselt ainult OlyBeti mängijatele! Võida ükskõik, milline UCOP Vegase turniir enne 28. aprilli ja saad lisaks UCOP Main Event tasuta pileti! Ole parimatest parim! Võida ükskõik, milline UCOP Vegas turniir ja kvalifitseerud mängima Tournament of Champions, mis toimub kolmapäeval, 1. mail kell 21:00 mille auhinnaks on online turiniiripiletite pakett väärtuses €1500. Lae alla meie uus pokkeritarkvara ja mängi! Online satellites for UCOP Vegas events will run from 8th April. 1st Eksklusiivne Las Vegase reis kahele väärtuses €7500 pluss 1 x online turniiripiletite pakett väärtuses €2500, mis sisaldab 1x €320, 1x €215, 8x €110, 8x €55, 10x €33, 10x €22, 10x €11 piletit. Vajuta SIIA et näha UCOP Vegas edetabelit. 1. The promotion runs from 00:01 on the 14th April 2019 and will run until 23:59 on the 28th of April 2019. Online satellites for UCOP Vegas events will run from 8th April 2019. For each event, the points are calculated as the square root of the buy-in* for that event, multiplied by the number of entrants to that event, divided by the final position of you. 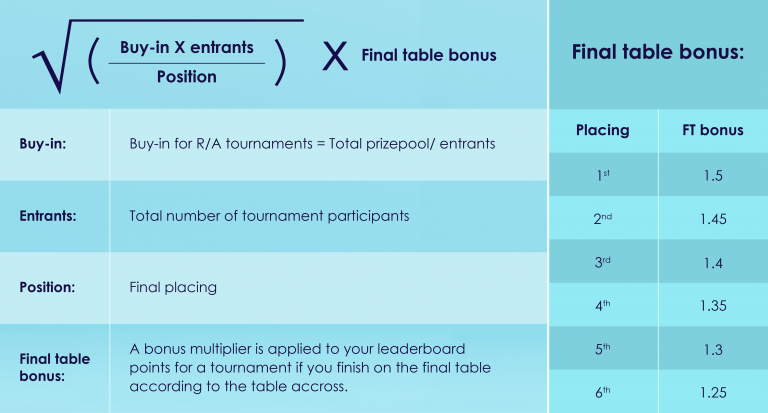 This figure is then multiplied by the final table bonus awarded to you for the event, which is based on the table below and is dependent on the final position achieved by you. *Buy-in for Re-buy and/or Add-On UCOP events is calculated as the total prizepool available to be won for that event, divided by the number of entrants to that event. For all other UCOP events (for example, Freezeout events), the buy-in is calculated as the cost to you to buy-in to that specific event. 4. The leaderboard positions will be finalised within 72 hours of the promotion closing. The winner of the leaderboard will be contacted by the OlyBet within 5 business days of this date and notified of their win. The winner must respond and accept the Prize within 10 calendar days of being notified, or the Prize will be forfeited. 5. Cash alternative to the Las Vegas trip for the 1st Prize winner is not available. 6. 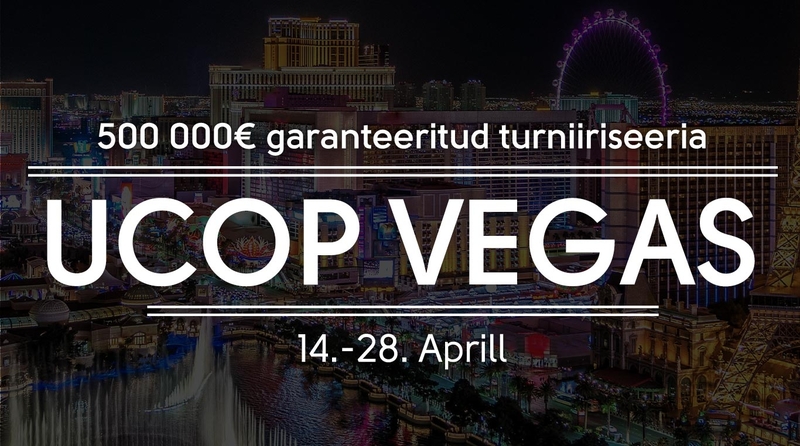 Each player can earn 1 ticket for the UCOP Vegas Tournament of Champions at 21:00 on 1st May 2019 if they win at least one UCOP Vegas event. For each additional UCOP Vegas event a player wins, they will start with an additional 5,000 chips. The winner of the tournament will win one online tournament tickets package worth €1,500 (1x €320, 1x €215, 4x €110, 4x €55, 4x €33, 5x €22, 6x €11 tickets). 7. We are not responsible for any adverse effects any participant experiences throughout the use of their prize. 8. We reserve the right to cancel or amend any instance of any network tournament at any time. 9. We reserve the right to withdraw this promotion at any time. 10. If you collude or otherwise behave unethically at any time, you will forfeit all prizes and you risk closure of your account. 11. You may not create more than one account with your poker room. If you do, you will forfeit all prizes and you risk closure of all your accounts. 12. In addition to these rules, all of the normal Microgaming Poker Network (MPN) rules and OlyBet poker room’s Terms & Conditions apply.